Paul Rossen and John Burke pose with their protest signs while selling anti-Trump buttons outside Trump Tower in Midtown. Photo by Samantha Springer. 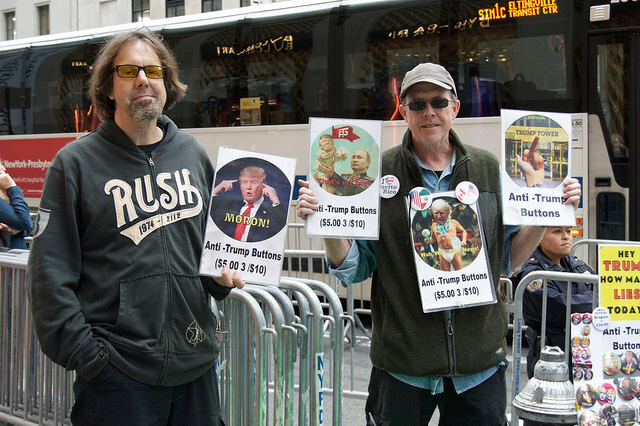 As President Donald Trump arrived in Manhattan today, two men used the platform of selling anti-Trump buttons to voice their concerns about the president and his policies. Paul Rossen and John Burke both live in Manhattan and have been taking to the street to publicly oppose President Trump for just over two years. 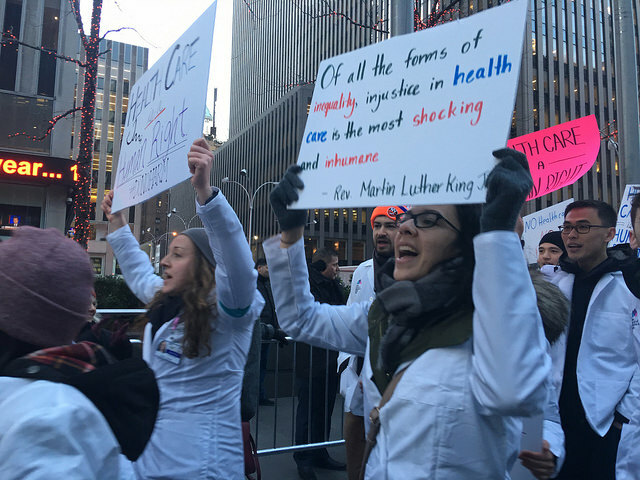 Rossen made the decision to start protesting in 2016, just after Trump announced that he wanted a Muslim ban. It is that very echo that motivates Rossen and Burke to spend hours every day standing on the street. Rossen originally started with just a few signs, but quickly moved to methods that got people passing by more involved. “I was out here for quite a while before doing the buttons, but now it’s a great 1-2 punch,” said Rossen. Paul Rossen and John Burke sell anti-Trump buttons for $5 each. Photo by Samantha Springer. 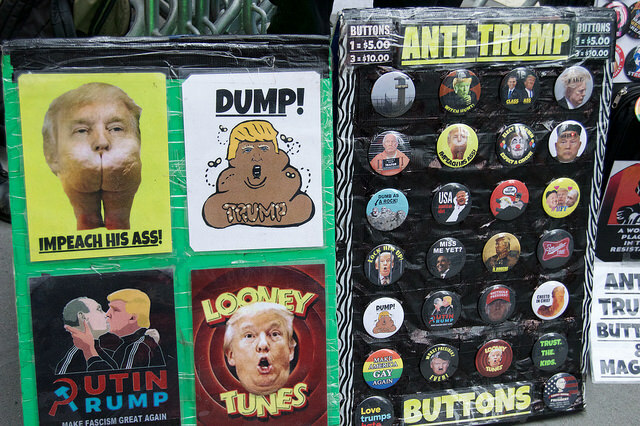 The buttons he and Burke sell bare satirical photos and phrases like, “Dump Trump” and “Cheeto in Chief.” At $5 per button or three for $10, it’s not about making money, it’s about starting a conversation. Burke joined Rossen about five days after the election in 2016. For him, the challenge people present is fun. Today, Trump came to town for only his third visit to his penthouse suite since taking office. The streets were littered with hundreds of cops and secret service agents, and the sidewalks were all but shut down with blockades, but Rossen and Burke were still there, selling their buttons. There were no other protesters on the streets, but they didn’t get any outstanding opposition or hate from Trump supporters, either. All joking aside, Rossen and Burke are seriously concerned for the future of their country. Rossen pointed out that like Trump, both Hitler and Stalin believed and advertised that the media is the enemy of the people. So, they’ll be back, rain or shine, day after day, to inform as many people as they can of the danger they see lurking on the horizon.